We rank the 5 Best Betta Fish Filters below, the models listed below are available in smaller and larger capacities. Once you find the brand and type of filter you like, be sure to dig further within the page to find the other sizes provided. Here is a short 4 minute video that will help you understand exactly what filters do for your tank, the different types of filters available and the filter media required for each filter. Now that you have a general idea of the types of filters available, let’s look at each of the best Betta fish filter options for you and your Betta fish. This is a much debated topic and I am not suggesting one method is better than the other, both have their merits. However, I will attempt to at least provide some direction and some options for those who would like to use a filter for betta tank. 1. Filters are used for other fish species so why not use a filter for a betta tank. By not providing a filter in your betta tank you are not providing them the best environment possible. 2. Betta fish prefer calm waters with little or no current. Filters are not required and by using a filter you may be putting your fish at risk. Some betta fish of the long-tail species, have large fins that can catch water currents like a sail and cause them undo stress and fin damage. While both positions have valid points, we believe it would be a mistake to paint all situations with only these two viewpoints. Our opinion is to consider your situation independently and supply what is best for you and your betta. Video: Do Betta Fish Need A Filter? Here is an awesome video explaining if betta fish need a filtered tank or not. Consider these points when you decide whether or not you need a betta fish filter. I have a half-moon betta with very long fins? You may want to set up a betta fish tank without filter. Or, maybe use a Sponge filter for betta tank which are great for small aquariums. A sponge filter will keep water movement to a minimum if tearing fins is a concern. My betta is kept in a community tank with many fish? Simply put, more fish = more waste = more toxins. A filter would be recommended in this situation. Also a community tank is likely to be a little larger providing your betta hiding places to escape water currents. How many water changes are you willing to complete, weekly or twice a week? If you can’t dedicate the time to change your water more than once a week a filter would be the way to go. My aquarium has many live plants? In this situation live plants actually act as a natural filter and can provide oxygen, filtration, food and a place to hide. Tank size larger than 2.5 Gallons: For this size a filter would be the way to go. Just ensure the filter has an adjustable flow rate to control the amount of current. Another option is to select a filter down a level rated for a smaller aquarium. Tank size smaller than 2.5 Gallons: First of all never keep your betta in anything smaller than 2.5 gallons. In small aquariums the water can foul much faster than larger aquariums, requiring more regular maintenance and water changes. Foul water can lead to multiple issues such as health, disease and even death. However, if you must keep your betta in something less than 2.5 gallons, we would recommend a sponge filter. To ensure the currents don’t become too strong and cause harm to your betta. For tanks smaller than 2.5 gallons we suggest you maintain a clean tank through regular water changes. However, there are filters that can accommodate tanks of this size. Do betta fish need a filter in their tank? All aquariums require clean water and filters are a great way to maintain clean water free from contaminants and allow the build-up of healthy bacteria that are beneficial to your fish. If you want healthy a Betta fish the water should be kept clean and clear. When deciding to have a Betta fish filter or no filter at all. Your situation should determine whether or not you need one. The best filter would be very gentle, and allow the ability to control the amount of current. Long-tailed betta fish like the half-moon betta are very fragile and their fins can be damaged form due to water movements. For these types of betta, no water movement is best. 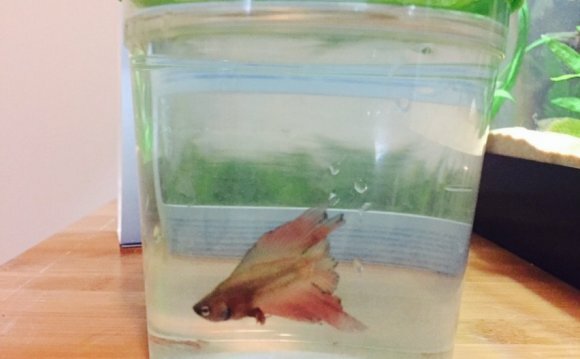 Don’t put your betta in a bowl or a vase. Betta need at least 2.5 gallons. If using a filter keep an eye on your fish to ensure they are adjusting well to the filter without issue. Under gravel filters can also be used. However, the debris tends to gather in the gravel and can become toxic and foul the water. In a small aquarium this can occur quickly and ultimately require more regular cleaning. In general, betta do best with gentle, low or no flow filtration. High flow currents can harm or cause stress to most betta fish.